In this Photoshop Effects tutorial, we'll learn how to easily add a rainbow, and even a double rainbow, to a photo! As we'll see, Photoshop ships with a ready-made rainbow gradient for us to use. We'll learn where to find it and how to load it in. We'll also learn how to flip the order of the colors in a gradient, which we'll need to do to create a more realistic double rainbow effect. Of course, as with most photo effects, it helps if you start with the right type of image. In this case, a photo taken outdoors is a good place to start. If it happens to be a landscape photo taken after a rain storm, even better! I'll be using Photoshop CS5 throughout this tutorial but any recent version will work. 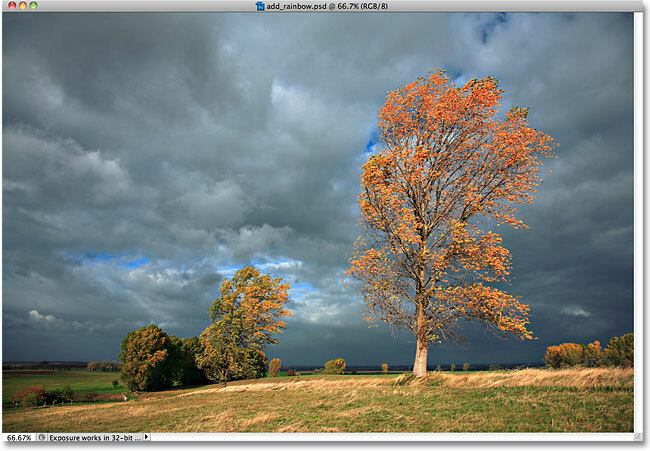 The photo sits on the Background layer in the Layers panel. Rename the new layer "Rainbow". Click on the Gradient Picker in the Options Bar. Click on the small arrow. Select the "Special Effects" gradients. Click "Append" to add the new "Special Effects" gradients in with the original gradients. 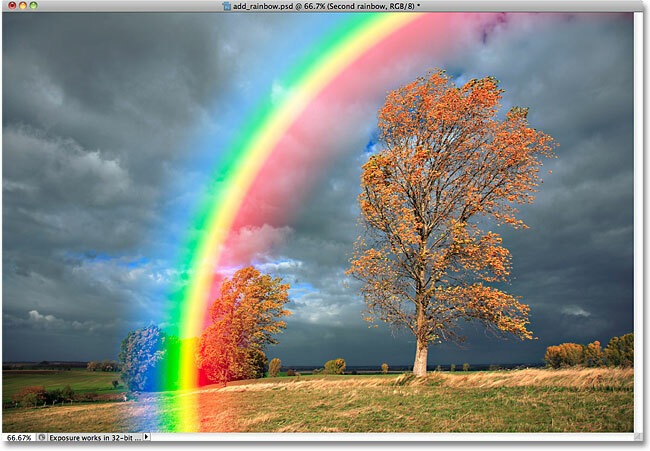 Click on the "Russell's Rainbow" thumbnail to select the gradient. Select "Radial" from the Options Bar. 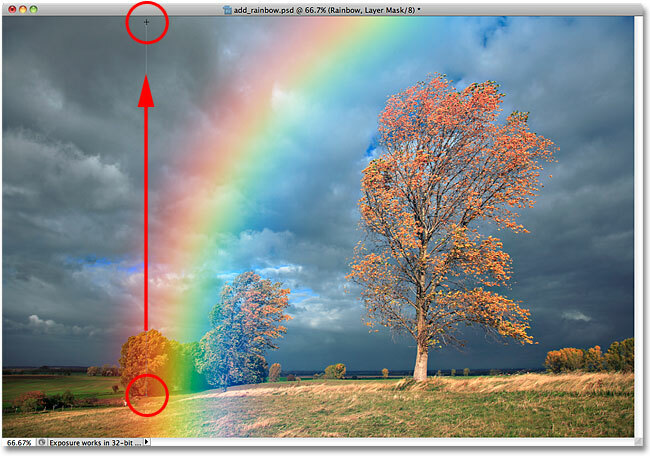 Dragging out a radial rainbow gradient from right to left in the image. 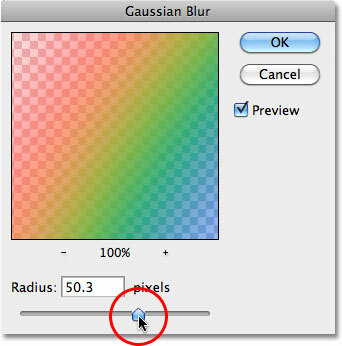 Photoshop draws the gradient when you release your mouse button. 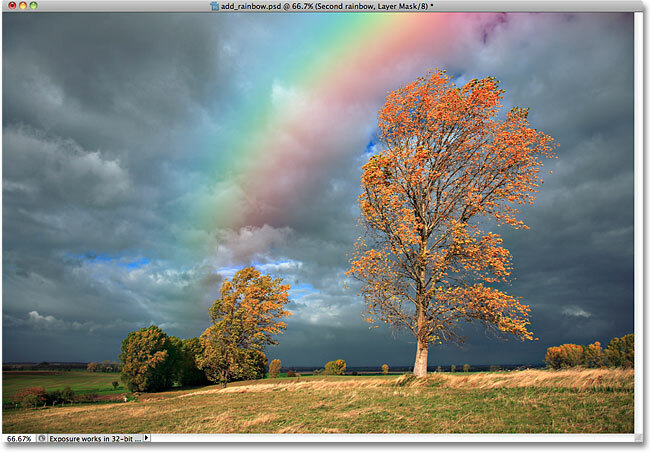 Step 5: Change The Blend Mode Of The Rainbow Layer To "Screen"
Change the blend mode of the rainbow layer to Screen. The rainbow after changing its blend mode to Screen. 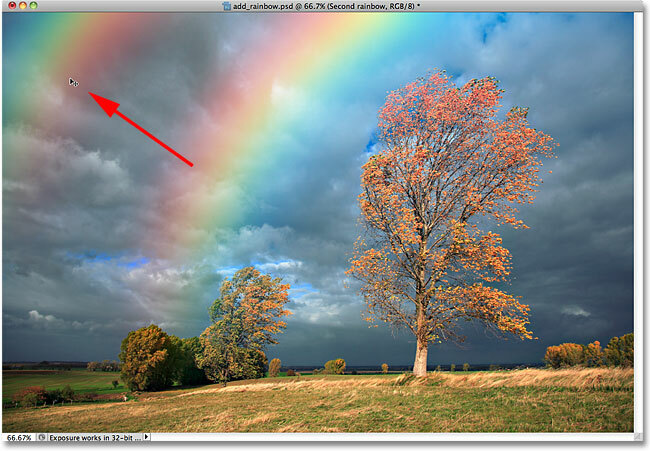 Drag the Radius slider to soften the color transitions in the rainbow. 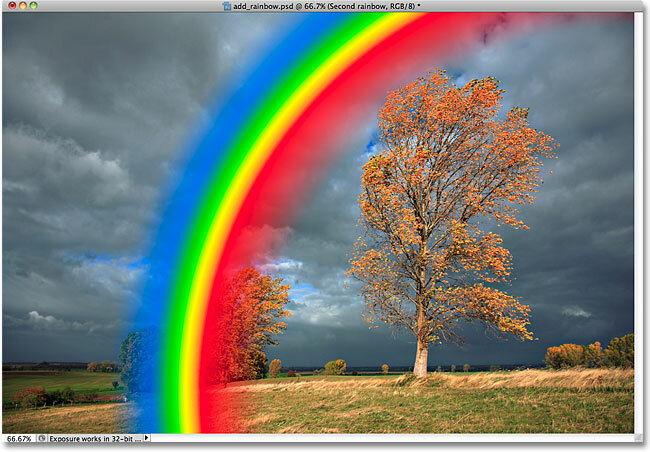 The rainbow now looks more realistic after applying the Gaussian Blur filter. Click the Layer Mask icon. The layer mask thumbnail tells us that a mask has been added. Click on the Black to White gradient's thumbnail to select it. Click on the "Linear" gradient icon. 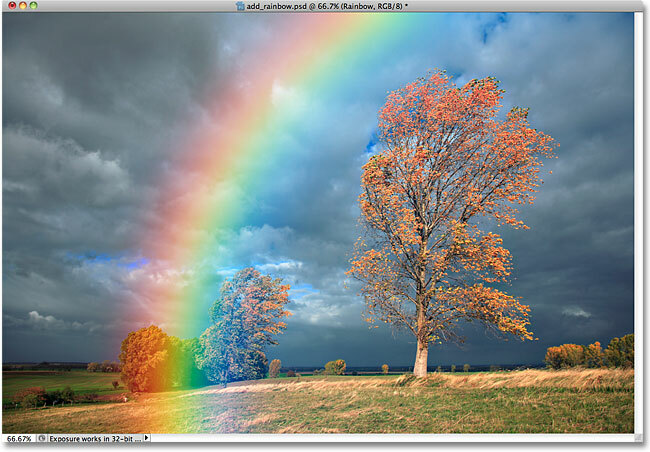 Drag a black to white gradient from the base of the rainbow to the top of the image. The rainbow no longer extends all the way to the bottom of the photo thanks to the layer mask. Press "Ctrl+J" (Win) / "Command+J" (Mac) to duplicate the rainbow layer, then lower the new layer's opacity as needed. The rainbow now appears brighter. The two rainbow layers are now inside "Group 1". Rename the new layer "Second rainbow". The Gradient Picker is currently showing the black to white gradient. Re-select the Russell's Rainbow gradient. Drag the blue, green and yellow color stops towards the left just to spread them out temporarily. Click on the red color stop, then enter 82% for the Location. Click on the yellow color stop, then enter 85% for the Location. Click on the green color stop, then enter 88% for the Location. Click on the blue color stop, then enter 92% for the Location. Click on the light gray stop above the gradient preview bar and change its Opacity value to 0%. Clicking on the visibility icon turns layers or layer groups on or off in the document. Select the Radial Gradient option again. Dragging out a second rainbow gradient in the same spot. The second rainbow gradient with its colors reversed. Set the blend mode to Screen. The second rainbow set to the Screen blend mode. The rainbow once again appears more realistic after blurring the colors. Click on the triangle to twirl open the layer group. Hold down Alt (Win) / Option (Mac) and drag the layer mask thumbnail onto the top layer. The layer mask has been copied from one layer to another. 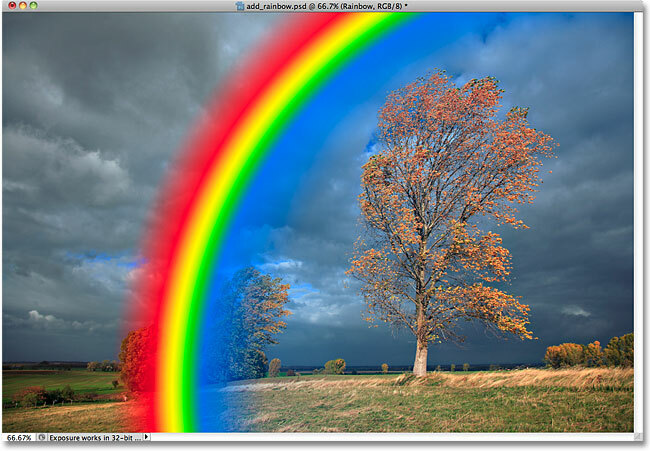 The image after copying the layer mask to the second rainbow's layer. When a layer or group is hidden, the eyeball in the visibility icon is also hidden. Use the Move Tool to drag the second rainbow into place in the image. Lowering the opacity of the second rainbow. And there we have it! 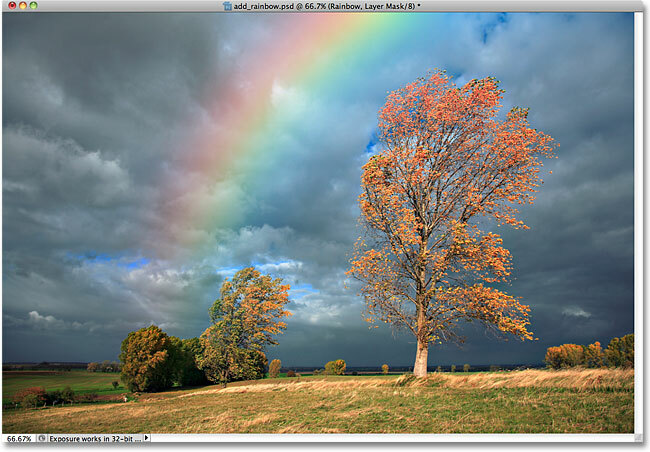 That's how to add a realistic-looking rainbow to an image with Photoshop! Visit our Photo Effects section for more Photoshop effects tutorials!